You know, if you’re looking for directions, this thing works pretty well, but if you want to order a restaurant meal, you better be talking to a human because most automated-speech-recognition engines are not ready for prime time. They can fail at a rate of up to 15 percent, which costs you real money and lost transactions. Current AI is not conversational and it’s not adaptive to a restaurant environment, nor is it adaptive to driving in your car. So, what we want to talk about is meeting the guests where they’re at in an omni-channel ordering solution, so that we can talk to them via voice, text, speech, mobile, social, and what I would call digital automation. We want to surround the guest with the synchronization of people, process, and technology. Meet them where they are and solve their needs. We’re now doing that with an artificial intelligence solution that’s second to none. They just don’t know how to talk to you! The majority of current AI tools are not “smart enough” to converse with guests. They do not have the technological capacity to adapt to guests’ needs, preferences and emotions in the moment. They’re just not advanced enough. Adaptability is essential for providing a great take-out-order experience for guests. You don’t want them to feel like they do when they call a government line or corporation where they just want to talk to a customer service representative because the AI keeps telling them, “I’m sorry, I didn’t get that. Can you please repeat?” You probably won’t build customer loyalty with that kind of service. In an article published by Wired in December 2016, writer Assaf Baciu questions the actual intelligence of the many rising artificial intelligence platforms. Baciu writes about how these technologies can appear very smart when pre-programmed for specific games or situations, but as far as adaptability to new situations without context, they’re lacking. Baciu states: “The fact is, no existing AI technologies can master even the simplest challenges without human-provided context.” Now, this article was written in December, and at SYNQ3, we’d like to offer that an actually intelligent AI that is adaptable to new contexts is now available: VIA. This restaurant ordering AI can actually adapt to human emotions and conversational elements that occur during phone calls; that’s pretty smart. Many AI solutions are not well integrated among multiple channels. To provide guests with the best experience possible, you have to meet them where they’re at, and that requires offering an omni-channel restaurant ordering solution; one that allows guests to converse with your restaurant via voice, text, speech, mobile, social, and digital automation. Restaurant AI should present guests with a seamless digital experience that is efficient, accessible, and simple. The first two points ultimately fall under this third, primary issue: many AI tools have been developed with an out-of-focus view on the purpose of restaurant technology. Deploying exciting, new AI technology is great except for when the technology does not actually put the guests’ needs first. All restaurant operations should focus first on how to provide guests with the best experience possible, and that means meeting them where they’re at in the way that they want. If the guest was overlooked during the process, then the solution will most likely not solve anything. Technology can appear great when it improves operations and cuts down in-house costs, but it doesn’t look so great when guests reject it and restaurants start losing business because their new tool increases complexity for the guest. Remember, convenience is king when it comes to serving restaurant guests. You have to provide solutions that are convenient, efficient, and simple. 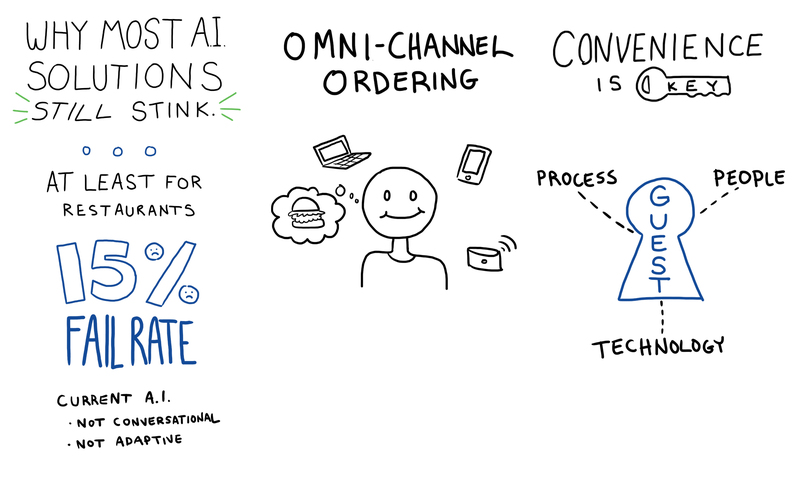 Providing omni-channel ordering solutions that feature advanced, conversational AI will make your restaurant stand out to guests. At SYNQ3, we’ve developed an AI solution that synchronizes people, process, and technology to provide guests with a reason to keep coming back to your restaurant. Don’t miss out on the opportunity to expand your business and grow sales with the help of advanced AI, contact SYNQ3 today for more information.